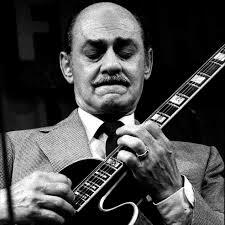 Joe pass was an American jazz guitar player. He used a lot walking-bass lines, chord melodies. His sense of improvisation, his knowledge of chord inversions, substitutions and progressions had a big influence on later guitarists. He's still one of the greatest guitar virtuoso of all the time. He used to play on a Gibson ES-175 and a D'Aquisto (especially built for him), plugged the most of the time in a Polytone minibrute. He also played an Ibanez following an endorsement. Stay tuned, subscribe to the newsletter, transcriptions are regularly posted. This jazz guitar lesson with tab is about a guitar walking-bass line in the style of Joe Pass.